Currently some people treated for Lyme disease, Babesia and Bartonella are reporting that they do not feel cured. The goal of this book is to interpret and synthesize articles from over a thousand other doctors and scientists into a meaningful explanation of why you or a loved one does not feel better after standard treatment. It does not claim doctor Schaller is the expert in all these matters, only that he has spent massive amounts of time looking at why people who have received the standard "cure" do not feel cured. This book is written to support the right of all physicians to treat their patients according to what they and their patients desire, without regard to arbitrary guidelines. Dr. Schaller is a full-time researcher and reader, and will only treat people for whom previous treatment has failed. He only helps patients clinically part-time--he does not have a huge 20-50 patients per day medical practice. Treating only those patients who are upset with their past healers does add risk. Some have deep and complex personality and emotional troubles due to their illnesses. Others come already with frustration due to past costly care that was "useless." Dr. Schaller has had good success with challenging patients. He also feels the help from a patient's past healers is almost always of use—they ruled out other troubles and offer informed consent. 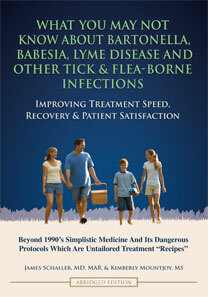 Below is the free copy of this book called: WHAT YOU MAY NOT KNOW ABOUT TICK AND FLEA-BORNE INFECTIONS. It is 164 pages. You may not POST THIS BOOK WITHOUT THIS PAGE LINK, meaning, if you want to post this book, post this link in toolbar above. Dr. Schaller does not claim to be perfect or an expert in anything. He is trying to offer other ideas and perspectives beyond what is routine in Infectious Disease Society of America (IDSA), National Institutes of Health (NIH) and alternative medicine positions. Samples of progressive thinking are in this book. If you just want a list of exact treatments down to exact dose regardless of any other variables, this is not the book you want. Dr. Schaller has found that even mentioning these options is dangerous for self-treating people in the long term. Our team feels this is a broad approach to tick and flea infections that is rare to find in the world. We are proud of this material. We are proud to offer it free after so many have worked for so long to create this informative book. We hope it helps you and your health care worker.